Otto Vogel was the son of Otto Vogel and Louise Alvinas Hinrichs. Alice Vogel was the daughter of Otto Vogel and Louise Alvinas Hinrichs. Harry Vogel was the son of Otto Vogel and Louise Alvinas Hinrichs. Henry Hinrichs was the son of Prismer Hinrichs and unknown (?). Henry Hinrichs died after 1934. John Hinrichs was the son of Prismer Hinrichs and unknown (?). John Hinrichs died after 1934. William Hinrichs was the son of Prismer Hinrichs and unknown (?). William Hinrichs died after 1934. Otto Hinrichs was the son of Prismer Hinrichs and unknown (?). Otto Hinrichs died after 1934. Louis Hinrichs was the son of Prismer Hinrichs and unknown (?). Louis Hinrichs died after 1934. (?) Bergan married Viola Boehner, daughter of Emil Boehner and Elisabeth Wilhelmina Sophie Lina Klemme, before 1949. Married Name 10 October 1943 As of 10 October 1943,her married name was Stolzenbach. Amanda Hasemann was born in 1896. She married Carl Stolzenbach, son of Eckhardt Stolzenbach and Caroline Shuette, on 10 October 1943 at Kankakee, Illinois. Amanda Hasemann died in 1945. Married Name Her married name was Luecke. Neta (?) married Elmer E. Luecke, son of Fred F. Luecke and Sophia Engel Schreck. Patricia Ann Luecke was the daughter of Elmer E. Luecke and Neta (?). Dorothy Stolzenbach was the daughter of Elmer H. Stolzenbach and Wilma Zirzow. Gene Cunningham married Irene Lydia Stolzenbach, daughter of Heinrich Johann Stolzenbach and Lydia Fay Frahm, in 1997. Married Name Her married name was Stoeven. Martha Voltmer married Edgar C. Stoeven, son of George Stoeven and Louisa (?). Martha Voltmer was born on 10 November 1899 at Lowell, Indiana. Martha Voltmer was buried in June 1970 at Saint Pauls Lutheran Cemetery, Kankakee, Illinois. 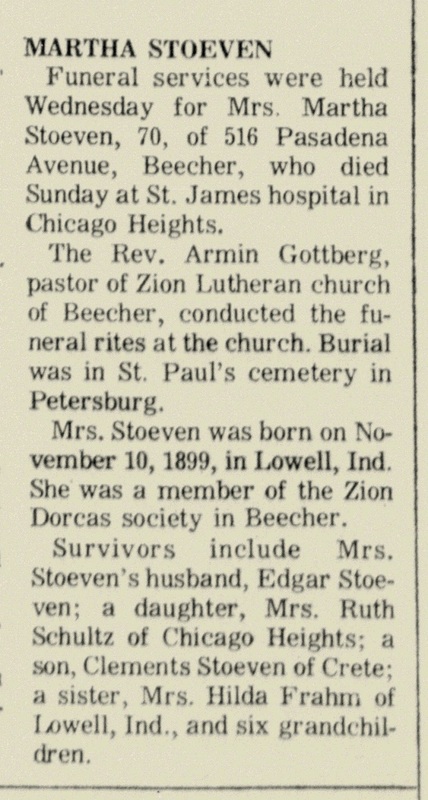 She died in June 1970 at age 70 Martha (Voltmer) Stoeven obituary. Lydia Voltmer was the daughter of August Voltmer and Lena Balgemann. Lydia Voltmer married Donald Clark. Lydia Voltmer died between 1956 and 1970. She witnessed the death of August Voltmer in October 1956 at daughter Mrs Donald Clark's house, Momence, Illinois; August Voltmer obituary. Donald Clark married Lydia Voltmer, daughter of August Voltmer and Lena Balgemann. Married Name Her married name was Wooton. Married Name Her married name was Wooten. Barbara Lee Meyer married (?) Wooton. Barbara Lee Meyer was born on 14 April 1948. 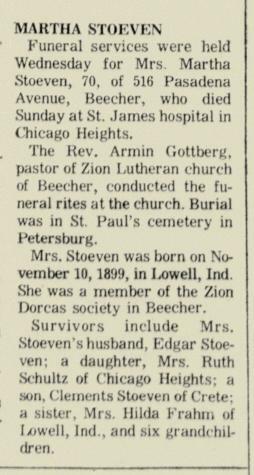 She was the daughter of Erlin Meyer and Leona Emma Stolzenbach. Barbara Lee Meyer died on 27 October 2010 at age 62. She was buried after 27 October 2010 at Skyline Memorial Park, Monee, Will, Illinois. Married Name Her married name was Raloff. Norma (?) married Harold E. Raloff, son of Valentine F. W. Raloff and Wilhelmine Caroline Frahm. Patricia Ohrt was the daughter of Leonard F. Ohrt. Clarence Lemke married Edna L. Buehre, daughter of Henry Otto Buehre Jr. and Mary O. Doering, in November 1927. Married Name 6 July 1947 As of 6 July 1947,her married name was Klemme. Margaret Holland married Vernon Harry Klemme, son of Henry August Klemme and Anna Sophia Schmidt, on 6 July 1947 at Spirit Lake, Iowa, Vernon Klemme and Margaret Holland wedding announcement. Margaret Holland witnessed the marriage of John Gene Kruse and Donna Jean Rehborg on 18 April 1953 at Milford, Iowa; Donna Jean Rehborg and John Gene Kruse marriage announcement. Margaret Holland died after 1994. On 6 July 1975 at LeMars, Plymouth, Iowa, attended Schmidt family reunion. Married Name 18 April 1953 As of 18 April 1953,her married name was Kruse. Donna Jean Rehborg was born circa 1932 at Iowa. She was the daughter of Gilbert E. Rehborg and Amelia R. Schmidt. Donna Jean Rehborg was the maid of honor at the wedding of James Wingate and Marilyn Joyce Rehborg on 4 October 1951 at Harris, Iowa; Marilyn Rehborg and James Wingate marriage announcement. Donna Jean Rehborg married John Gene Kruse on 18 April 1953 at Milford, Iowa, Donna Jean Rehborg and John Gene Kruse marriage announcement. Name Variation John Gene Kruse was also known as Jack. John Gene Kruse married Donna Jean Rehborg, daughter of Gilbert E. Rehborg and Amelia R. Schmidt, on 18 April 1953 at Milford, Iowa, Donna Jean Rehborg and John Gene Kruse marriage announcement. Married Name before 1949 As of before 1949,her married name was (?) Clemmets. (?) Behlke was the daughter of Harry Ernest Behlke. (?) Behlke married Richard Clemmets before 1949. (?) Behlke died after 1949. December 28, 1956, Chicago Heights, Illinois). Richard Clemmets married (?) Behlke, daughter of Harry Ernest Behlke, before 1949. Richard Clemmets died after 1949. Married Name before 1956 As of before 1956,her married name was Helmke. Unknown (?) married Gilbert Otto Helmke, son of Otto Helmke and Minnie Behlke, before 1956. March 27, 1956, Chicago Heights, Illinois). Married Name before 1934 As of before 1934,her married name was Bremer. Unknown (?) married Carl Bremer, son of Friedrich Heinrich Bremer and Bertha Klemme, before 1934.